Mother’s Day is just around the corner, which means it’s time to start thinking about a gift for the woman who raised you. Give her a break from the same boring flowers and a card and give your wine-loving mother something she really wants. Below are our top 10 Mother’s Day wine gifts for the wine enthusiast in your life. A superior taste in wine calls for superior storage. If your mom is looking for a new way to store her wine collection, we have plenty of storage related wine gifts to suit her needs. We offer a number of wine coolers which range in style and capacity. So whether your mother is a casual wine drinker that only needs a couple of bottles stored at a time or a burgeoning wine collector, there is a wine refrigerator perfect for her. Our wine refrigerators offer a variety of desirable features, including compact designs and quiet operation. These features allow for the cooler to be placed almost anywhere in your mom’s home, which is suitable for any kind of dwelling. Also consider some of our built-in options with sizes that range from 6-bottle storage to over 200-bottle storage. Whether your mother is a wine collector or just keeps a few bottles at hand, she’ll be sure to have all the storage she needs. If your mom is a wine aficionado, chances are she knows the importance of a wine decanter. Celebrate her this Mother’s Day with one of her very own, or replace her old one with a shiny new one. There are so many options of wine decanters to consider. We offer a variety of of shapes and sizes, all of which are conveniently scratch- and etch-free. These wine accessories are made from lead-free crystal. We offer almost any type of wine glass you can think of, and the glasses are typically offered in a set of 6. Our stemware is crystal, durable, and dishwasher safe, meaning this is a gift that will last a lifetime. You can really cater these wine gifts toward your mother by purchasing a glass set that complements her wine tastes. Certain glasses are best for lighter wines and roses, while others better suit darker red wines. No matter what your mother’s wine preferences are, there is a stemware set that will perfectly suit her needs. Also consider gifting your mother a restaurant-grade stemware cleaner so her wine glasses stay as shiny as they were straight from the box. Wine racks can completely alter the atmosphere of any kitchen. From ultra-modern styles to more traditional options, there is quite a variety of wine racks to pick from, meaning you are almost certain to find a table top or wall mounted rack that perfectly complements your mother’s kitchen or entertainment space. Wine racks allow you to give your mom not only something extremely useful, but something that shows off her quirky personality. For example, the True Fabrications’s The Swell Wooden Wine Rack, pictured right, really defines a mother because it’s the perfect mix of what makes her who she is. The darker wood is mature and sophisticated while the wave-like design is fun and free-spirited, just like your mom. This wine gift is the perfect marriage of useful and thoughtfully personal that your mom will love. Most models include step-by-step instructions and all required building hardware. All that is left for you to do is supply the wine! You can’t enjoy your wine before you open the bottle! A corkscrew is a necessary item in any kitchen. Unfortunately most of us have cheap drug-store corkscrews that are difficult to use and prone to tearing the cork. Consider gifting your mom a brand new, top-of-the-line corkscrew. Certain nicer corkscrews are compact and sleek, and offer high tech features such as an automatic corkscrew and ejector, an LED illuminated screen, and a built in foil cutter. Corkscrews with these features are perfect for stocking your mom’s home bar, and are compact enough to fit into a kitchen drawer. The consolidation of several wine tools into one makes it easy to store and keep track of. Think about it: you have to open your wine before you drink it. If you’re going to get your mom a wine gift, this truly is a can’t-fail option. Maybe your mom picked up a bottle of wine after work one day and wanted it ready to enjoy as soon as she got home. Wine chillers, such as the Vinotemp Silver One Bottle Chiller/Warmer, are exceptionally useful if you need to bring your wine to the correct temperature quickly. The temperature range for wine chillers is typically between 37 and 122 degrees Fahrenheit. They are also super portable and frequently sport an AC/DC power cord, making them chargeable on a boat or in an RV. This would be a great gift for an outdoorsy mom or one who likes to travel. Anywhere that you have access to electricity–but not necessarily a full refrigerator–would be a great place for this addition. Wine aerators and pourers expedite your wine decanting process and still provides high standard results. Wine aerators offers several different aerating positions, giving you many different pouring options to suit your different wine varieties and personal taste, so your mom can aerate her wine her way, and you and anyone else has the freedom to do it another way. When you aerate your wine, you soften the tannins, giving you a fuller and brighter flavor than you would otherwise taste. So the steeper you tilt this spout when you pour, the more aerated your wine will taste. The compact size of this equipment enables you to take it with you on the go! Maybe you’re mom isn’t as much of a wine enthusiast. Maybe she doesn’t need a 12-bottle wine refrigerator. These preservers are perfect wine gifts for the wine-lover that sticks to the glass-a-day rule. Ensure your wine stays fresh and preserved by resealing it when you’ve had your fill. With wine gifts like these, you wine-loving mom is sure be happy. Pictured is our Metrokane Rabbit Wine Chilling Carafe. This stylish carafe and other similar items cool your unrefrigerated wine quickly, and holds the cool for up to 90 minutes. Most chilling carafes are designed to hold a full 750ml bottle of wine, which makes them a perfect gift for a social mom who likes to have a few guests over for a cool drink every now and then. This particular carafe is ideal for white, rose, and zinfadel wine, but it can also be used for other drinks such as lemonade or iced tea on a hot day. One of the best parts of this carafe is that it cools naturally with a metal ice chamber, which means no plastic or freezable chemicals that can infiltrate your wine. Once all of the wine is gone, this carafe can be easily cleaned in the dishwasher. Lazy Susans have been popular for a very long time now, and for good reason. Their functionality paired with many fun and modern designs that you see today make Lazy Susans anything but obsolete. This Lazy Susan Cork Display by True Fabrications doubles as a unique display, allowing your mom to show off her cork collection right on her dining room table. Turn your mother’s hoard of used corks into a beautiful conversation piece that promises style and function. Included is the rubber wood frame and the removable glass top, so your mom can fill it up with corks that are unique to her and her wine-drinking memories and tastes. Measuring 19″ across, this centerpiece holds approximately 130 corks–that’s a lot of wine! 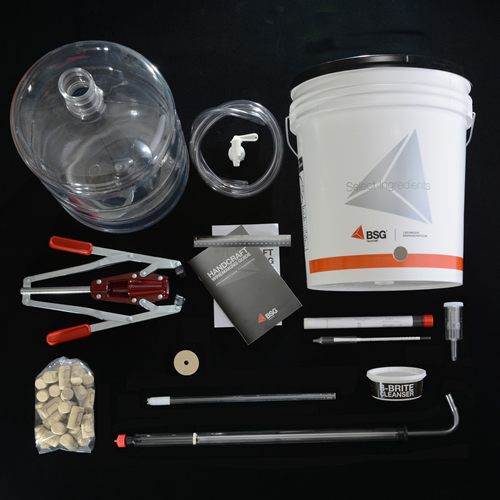 The BSG Wine Equipment Kit and similar products are unique wine gifts. These kits typically include all the supplies needed to begin crafting your very own wine right at home. This is perfect for anyone who wants to break into the wonderful world of winemaking. With this kit, you receive one 7.8 gallon fermenting bucket with airlock, a plastic carboy, an adhesive thermometer, a dual function bottle filler, a bottling spigot, cleanser, a glass hydrometer, a corker with 30 Neutrocorks, and an Enjoy Home Winemaking booklet by Robert and Eileen Frishman, which offers valuable information and tips on how to get started. Many other kits availble online offer similar items, but be sure to thoroughly understand exactly what is included in your desired package before you purchase. With the help of a wine crafting kit, your mom will be a winemaking pro in no time at all.